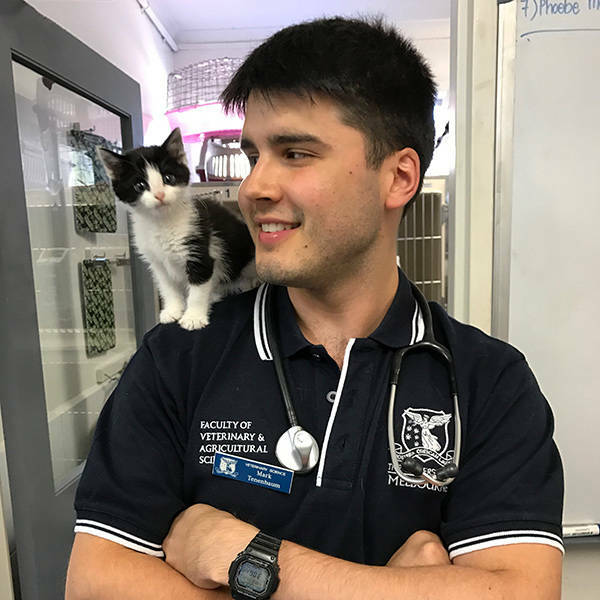 "I think showing the Bondi Vet audience what it takes to become a veterinarian and what's involved would be both unique and important"
I've looked at all the vet student's and Mark Tenenbaum has my vote - he has the makings of a dedicated vet who is a true advocate for animals. Good luck Mark! I have known Mark for 2.5 years as a colleague in the DVM course. His enthusiasm and positivity is infectious and he is always up for a laugh. He has worked incredibly hard to build his business 'The Vet Society' and his passion for animals is undeniable. Mark is a very passionate person, particularly when it comes to animals. He is extremely driven and most importantly is charismatic and engaging. As a vet student myself, it would be an inspiration for me to watch such a confident and entertaining person show his talent. I have been following Mark and The Vet Society since he started his Veterinary journey. I would definitely start watching Bondi Vet if he made the Vet student appearance!!! Being a Vet student myself, it would be inspirational seeing a student explore the journey to becoming a Veterinarian. Not only is Mark extremely smart, hard working and dedicated, he is also extremely FUNNY and charming (and handsome) - the ladies would fall in love with this young man on TV. Mark's ability to understand and communicate his Veterinary knowledge to the public is one of his key strengths. Whenever I have questions, he is able to provide me answers and insight that I (lay person) can understand. He has a spoodle named Skye who he adores. I've known mark for almost 20 years. His devotion to animals is unrivalled, as is his ability to apply himself to his passions. Mark is admired by most, and loved by many - his potential as a Dr of veterinary medicine is limitless. For the last 2 years that I've known Mark, he has shown such a passion for his career and a true dedication to learning and loving animals. He also provides great entertainment value with his humor and ability to make light of every situation. Mark is dedicated to learning and caring or all animals! He would be a perfect character on the Bondi Vet show. It would definitely incentivize me to watch the show!! !